ODP Poll Results in The Hill, Parks Mean Profits, and Penguin Name Finalists – Vote by Tweet Now! Forward ODP to a friend! 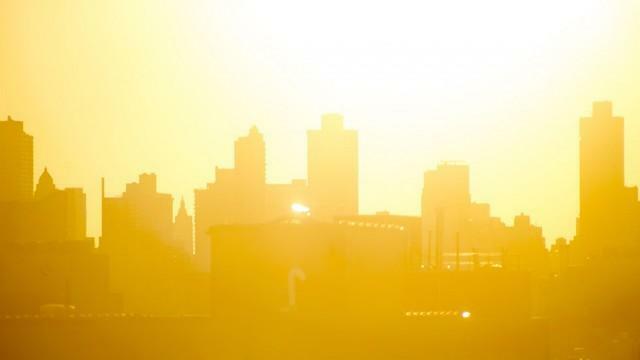 Last Friday, The Hill's Miranda Green wrote about the results of our new poll conducted by Change Research with the headline, "Environmental concerns may turn voters blue: poll." Noting that a Pew Research Center poll in 2016 showed that environmental issues were of low concern to voters at the time, Green concluded that the ODP Poll results point to a dramatic change in voter attitudes. Green wrote that "[w]ith the surge of scandals surrounding EPA Administrator Scott Pruitt and a number of regulatory changes made at the agency, some groups and policymakers are hoping that the environment will become a top voting issue in 2018 and beyond." The ODP poll found that voters look predominantly to the Democratic Party to lead on environmental issues. Those polled also said they trusted Democrats more than Republicans to handle conservation issues by a 43-24 percent margin and pollution issues by a 44-22 percent margin. Make sure to read ODP tomorrow where we'll share some more results of our poll that demonstrate how a potential "green wave" could help power a "blue wave" in Congressional elections this Fall as voters grow increasingly concerned about the environmental regulatory rollbacks the Trump administration has prioritized. Why This Matters: The ‘Environmental Anxiety Index’ published last Friday should set off alarm bells for Republicans. Voters are rejecting Trump’s pro-business environmental policies, denial of climate science, and reduced protection for public lands and wildlife. The environment hasn't traditionally been a voting priority for American voters but recent attacks on clean air, clean water, biodiversity and public lands could be increasingly important to them to when casting their ballots in November's midterm elections. One of our goals in creating ODP was to show that a healthy environment is a paramount issue for all Americans regardless of where they live or to which political party they belong. We hope that this data, which shows that a healthy environment is an important issue for Americans regardless of where they live or who they voted for in 2016, will encourage political candidates of both parties to make protecting the environment a priority issue in their campaigns. 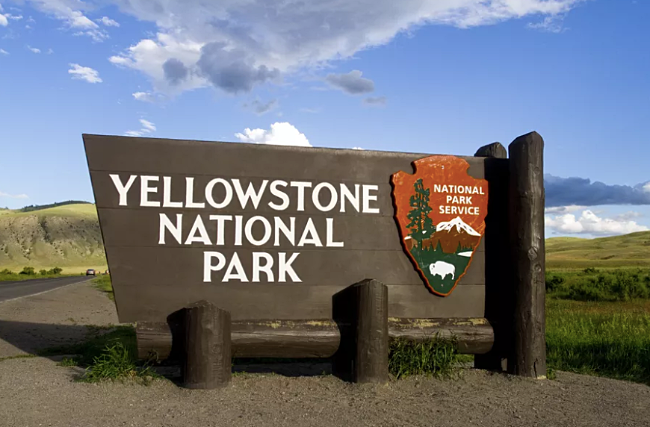 National Parks remain hugely popular destinations, despite the maintenance backlog and infrastructure needs according to a report issued by the Park Service late last week. In 2017, national parks had 330 million visitors and added $35.8 billion to the U.S. economy, which was a nearly $1 billion increase from the year prior. Communities near parks benefited from $18.2 billion in visitor spending and supported 306,000 jobs, which is a huge economic boon for communities, particularly in the West. Interior Secretary Ryan Zinke said in a statement, "[t]his report illustrates the incredible economic value of our national parks and further shows the value in President Trump's plan to rebuild park infrastructure." The National Parks are showing their wear, with $11 billion dollars of maintenance projects waiting for funding from Congress. The Trump Administration proposes to pay for these maintenance projects with oil and gas revenues derived from federal leases. Recently, Secretary Zinke withdrew a proposal to nearly triple entrance fees for some of the country's most-visited parks after a public outcry. Why This Matters: As Ecowatch reports, the Trump Administration, in its latest budget, proposed massive cuts to the National Park Service, including the firing 1,835 employees. This seems like a monumentally bad idea at a time when park visits are at record highs. Using oil and gas revenues to pay for park improvements provides perverse incentives in favor of drilling on federal lands. Park maintenance ought to be paid with ordinary appropriations -- these maintenance projects are a good investment that clearly pays dividends to the public and local communities that host parks. 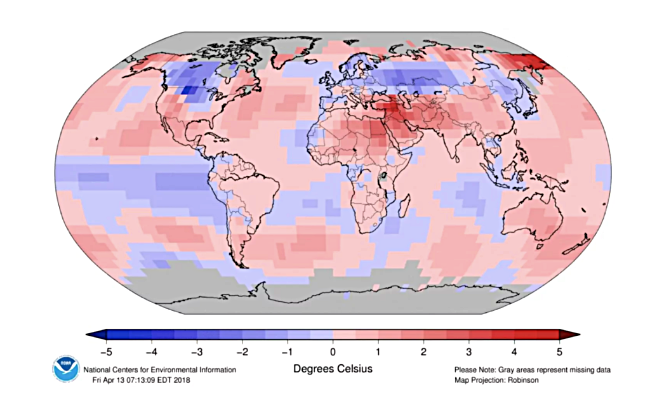 The first quarter of 2018 was cooler than the last three years, marking a change in the previous years' increases, but it still comes in as the fourth warmest on record. 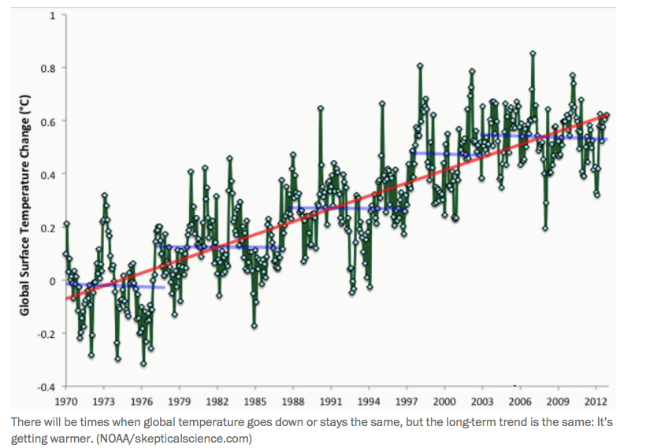 According to the Capital Weather Gang in the Washington Post, temperature anomalies hit record peaks in 2016 but have been sliding since then. Why? Normal heating and cooling variations are still at work so there can be fluctuations year to year even as the warming trend continues. The Pacific Ocean is cooling and because it is the largest body of water on the planet, it can have a big impact on global temperatures. Scientists have seen this kind of global temperature dip before -- the same occurred after the super El Niño in the late ’90s. In 1998, previous temperature records were broken part because of that year's warm El Niño water pushing global temperatures higher than ever before at the time. The Earth's temperatures boomeranged from one of the strongest El Niño events on record (very warm waters in the central Tropical Pacific) to a few years of cooler waters, thanks to a La Niña period. The same seems to be happening now, after a very strong El Niño in 2015-16. 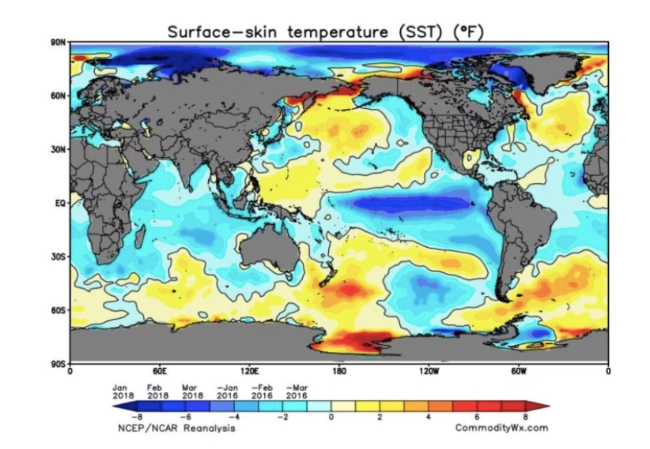 The map below shows much cooler water temperatures in the Pacific Ocean at the Equator as compared to 2016 at the same time. Why This Matters: While these year to year fluctuations may make some people think that climate change is not real, nothing could be further from the truth. Overall the temperature trend lines remain steadily increasing as you can see in the graph below. And scientists are already seeing signs that we may have a warmer than usual Pacific Ocean (another El Niño) next year. So this cooling off is most likely short-lived. H/T to Matty G for asking us to explain this contradiction -- yes, the Earth can be cooler this quarter and still be warming. From Inside Climate News: "Four states—Iowa, Kansas, Oklahoma and South Dakota—now get more than 30 percent of their in-state electricity production from wind, according a new report by the American Wind Energy Association. Each of those states voted for Donald Trump in 2016, and each is represented by Republicans in the Senate and has a Republican governor." Breaking the study down further, the top 10 congressional districts for installed wind power capacity are represented by Republicans, including CA-23 which is represented by House Majority Leader Kevin McCarthy. 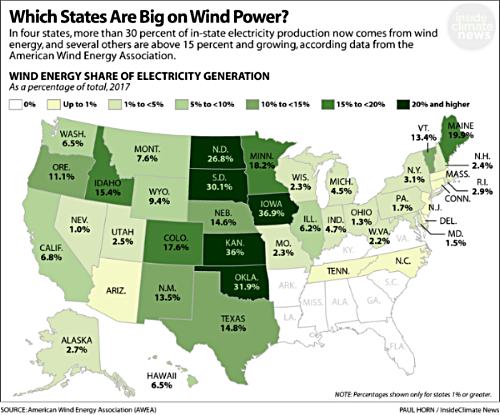 Wind currently represents 6 percent of America's electricity generation and is expected to pass hydroelectric power as the largest source of renewable energy in America in 2018. Why This Matters: A rapid transition to carbon-free energy sources is our best chance to reduce climate change. Wind energy, especially with new technological developments offshore, is a big component of getting us to a low-carbon future but the right policies need to be in place to make this possible. While the U.S. wind power industry continued to expand last year, its growth rate slowed with 7 gigawatts of capacity added in 2017, down from more than 8 gigawatts added in 2016 likely because of changes to the Renewable Energy Production Tax Credit which began phasing down last year. 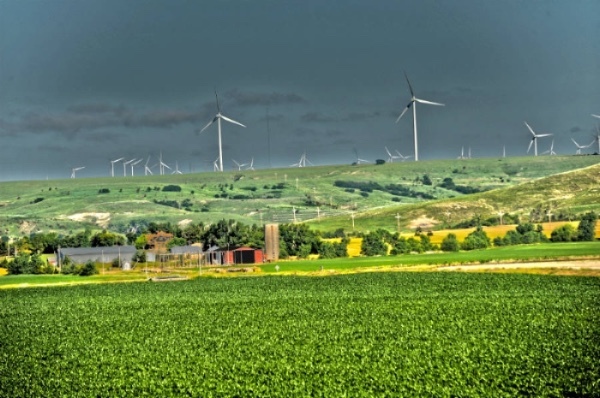 In Oklahoma, the state with the second-highest wind power capacity, the governor signed legislation in 2017 to end state tax incentives for the industry three years early amid a budget crisis. Meanwhile, countries like Germany have expansive incentive schemes (known as Energiewende) to help support the wind industry and transition away from coal and nuclear. We've talked about algal blooms in the Great Lakes before but the problem is pervasive and happening throughout the country. 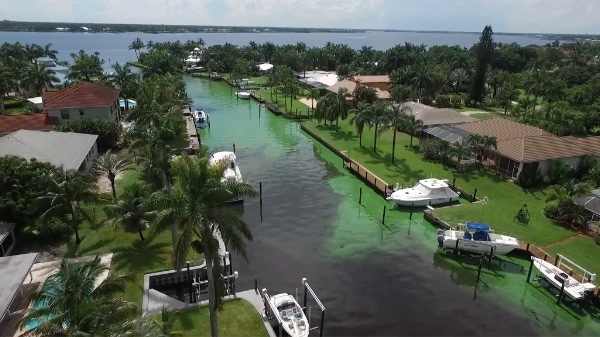 From Seattle to the Everglades these harmful blooms known as red tides, blue-green algae or cyanobacteria have severe impacts on human health, aquatic ecosystems and the economy. Human health symptoms can include skin/mucosa irritation, flu-like symptoms, and gastrointestinal illness. Severe cases could include seizures, liver failure, respiratory arrest-even death, although this is rare. The risk of respiratory illness in humans can afflict those who inhale tiny, aerosol particles created by wind and waves. As The Conversation noted, reported cases of algal blooms, when algae grow rapidly from an influx of nutrients in waterways, have been rising at an exponential rate in recent decades largely as a result of industrial runoff into waterways. Why This Matters: When these blooms occur they effectively shut down beaches for weeks or months on end, posing a risk to people and coastal economies. The seafood industry especially suffers (even threatening the survival of Florida's famed stone crabs). The toxins from various types of algal blooms can become dangerously concentrated within shellfish, especially filter-feeding clams, mussels, oysters and scallops. While the detection of blooms often leads to the closure of shellfish beds by authorities, human deaths have occurred in areas where such regulation does not exist, and also in areas where new blooms are believed to be forming for the first time, catching people off-guard. In South Florida, fertilizer makers are offering a $10 million prize for technology that can help stop these blooms, although the ultimate solution would be to stop runoff in the first place. Go Deeper: In 2016, the Weather Channel came out with an investigative piece called "Toxic Lake: The Untold Story of Lake Okeechobee" that gets at the root cause of Florida's toxic algae blooms. We highly recommend you take the time to watch! We will admit it! We have a soft spot for penguins. And it seems you do too! 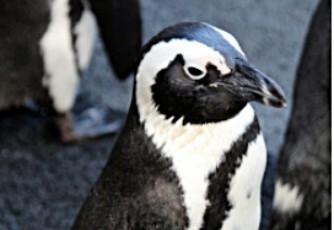 Last week, in honor of World Penguin Day, we adopted this adorable little bird from the Southern African Foundation for the Conservation of Coastal Birds (SANCCOB). This wonderful organization, whose primary objective is to reverse the decline of seabird populations through the rescue, rehabilitation and release of ill, injured, abandoned and oiled seabirds, allows those adopting a bird to name it. So we decided to have a contest to give our bird a name and then tweeted about it. Suggestions poured in. Tweet us your favorite choice at @ourdailyplanet! The name with the most votes tweeted to us will be the winner! Vote early and often! Get your friends to vote too! May the best name win! Copyright © Our Daily Planet 2018, All rights reserved. We're committed to bringing you the best stories about people and planet, have a tip or feedback? Send it our way! Like what you see? Make ODP part of your morning and sign up.